Dr. Eck received a Bachelor of Science degree from the Catholic University of America in Biomedical Engineering, followed by a Master of Science degree in Biomedical Engineering from Marquette University. Following this he worked as a research engineer conducting spine biomechanics research. He then attended medical school at University of Health Sciences. He is board eligible in orthopaedic surgery. Nerves carry electrical signals from the brain to the body and vice-versa. A pinched nerve can cause symptoms like pain, numbness, tingling, or weakness along the path of the pinched nerve. Most people improve from a pinched nerve with rest, ice, medication, or physical therapy. Weakness or wasting of the muscles from a pinched nerve can suggest permanent nerve injury. Nerves are like electrical cords distributed throughout the entire body that carry information from the brain to the rest of the body and vice-versa. Motor (efferent) nerves carry information from the brain out to the body. This allows the brain to send commands to the various organs of the body. For example, these commands are sent to the muscles causing them to contract and move, or to the heart to either beat faster or slower. Sensory (afferent) nerves send information from the body back to the brain for processing, including information about pain, touch, taste, temperature, or other sensations. The information travels along the nerve by an electrochemical signal, much like information traveling along an electrical cord. When a nerve is pinched, the signal is interrupted somewhere along its path. A pinched nerve is caused when a nerve is somehow damaged or injured by direct pressure or compression and is unable to properly conduct its signal. There are many potential causes for a pinched nerve, depending on the location of the nerve. A pinched nerve in the neck or lower back can be caused by a herniated disc, arthritis, bone spurs, or spinal stenosis. Spinal stenosis is a narrowing of the spinal canal through which the nerves pass with the spine. A pinched nerve in the lower back or buttock can compress the sciatic nerve, which can cause sciatica. A pinched nerve in the wrist can be caused by carpal tunnel syndrome. This condition is caused by compression of the median nerve as it passes through confined tissues of the wrist. Cubital tunnel syndrome is a similar condition caused by compression of the ulnar nerve in the elbow. Both of these conditions are more common in people with diabetes and people who perform repetitive activities such as a typist, using a computer keyboard for long periods of time, or assembly line workers. Swelling around a nerve can be caused by an injury, bruise, or other conditions, including the swelling of the extremities that can occur with pregnancy. An inherited tendency, as manifested by a family history of a similar condition, can also increase an individual's chance of developing a pinched nerve. The symptoms of a pinched nerve depend on what nerve is affected. Each nerve is responsible for sending information to or from specific parts of the body. weakness of the muscles along the path of the nerve. A pinched nerve sensation may feel like, for example, the sensation when a part of your body has "fallen asleep." A pinched nerve can cause symptoms at the site of damage, or any location further down the path from the affected nerve. A pinched nerve in the neck can cause neck pain or stiffness, along with symptoms down the arm. A pinched nerve in the lower back causes back pain and stiffness with symptoms down the leg. A doctor can often identify which nerve is pinched in the neck or lower back based on what portion of the patient's arm or leg is affected. A pinched nerve in the wrist from carpal tunnel syndrome typically affects the thumb, index, and middle fingers. It can also cause a weakness in the person's grip strength, and atrophy of the muscle of the palm near the thumb. A pinched nerve in the elbow from cubital tunnel syndrome affects the forearm, the ring (fourth finger), and the small fingers of the hand. The doctor will begin by asking the patient various questions about his or her pain, numbness, tingling, weakness, and other symptoms. The patient may also be asked about other medical conditions, work history, and family medical history. This information can often assist in identifying the nerve(s) affected. The doctor will then examine the part of the body involved. This may include testing the patient's strength, sensation, and muscle tone in specific muscles. Depending on the results of the medical history and the physical examination, the patient may need additional tests. If the doctor suspects the patient has a pinched nerve (compression of the nerves) in the neck or lower back, X-rays may be necessary to assess possible injury to the spine or arthritis of the spine. Depending on the severity and duration of the patient's symptoms, he or she may also need a CT scan or an MRI scan. These imaging studies provide additional information about a pinched nerve not seen on regular X-rays, and can provide additional information in preparation for surgical intervention if necessary. The doctor may also recommend specific tests for the affected nerve including a nerve conduction study or an electromyography (EMG). In the nerve conduction study, the test stimulates the nerves with a mild electrical impulse and measures speed of the impulse traveling in the nerve. In the EMG, a small needle is placed into the muscle while the patient contracts the muscle to measure the electrical activity of the muscles. In many cases a pinched nerve can be treated with rest and ice. If the pinched nerve is in the arm (carpal tunnel syndrome or cubital tunnel syndrome) the doctor may recommend a brace for a short period of time. The brace limits the amount of movement around the nerve, which allows it to rest and recover. The brace also prevents the patient from movements that may further compress or pinch the affected nerve. A brace used for carpal tunnel syndrome covers the wrist and and is extended slightly back. This is because during flexion (bending the wrist down) the median nerve in the wrist is further pinched. The brace for cubital tunnel syndrome in the elbow can be used to keep the elbow from bending too much which further stretches the ulnar nerve. Various medications can also be used to treat a pinched nerve. Anti-inflammatory medications, for example, ibuprofen (Advil) or naproxen (Aleve) can reduce the inflammation (swelling) around the affected nerve. Other medications used specifically for nerve related pain include gabapentin (Neurontin) or pregabalin (Lyrica. Physical therapy can assist to stretch and strengthen specific muscles in the body, which helps relieve the pressure on the pinched nerve. If the symptoms from a pinched nerve do not improve with the above treatments, surgery may be recommended. Surgery may also be recommended if the patient develops additional weakness in the muscles, or if the particular nerves being pinched cause loss of control of the bowel or bladder (cauda equina syndrome). These are signs of more severe nerve damage. Surgery for a pinched nerve depends on the location of the nerve being pinched. If the pinched nerve is in the wrist (carpal tunnel syndrome) or elbow (cubital tunnel syndrome), the surgeon can release the tissues over the nerve in the wrist or elbow to free the nerve tissue pressure. If the pinched nerve is in the neck or lower back a spine surgeon or neurosurgeon can remove a portion of the disc or bone spurs that are compressing the nerve in the spine. In some cases, if it is necessary to remove large portions of bone or disc, the surgery may require a spinal fusion to stabilize the spine after freeing the nerve. 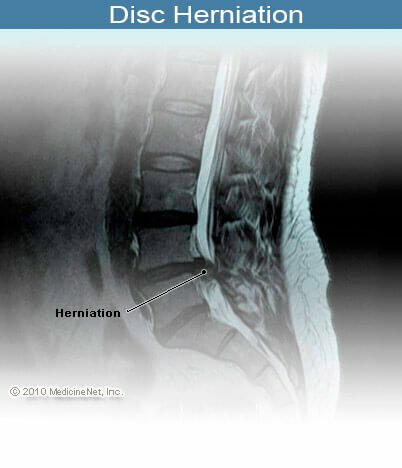 In the MRI image below, the herniated disc is occluding the nerves in the spinal cord. In most cases, individuals with a pinched nerve are able to recover completely without any long lasting symptoms. Most patients respond well to conservative treatment including rest, activity modification, ice, physical therapy, and medications. Surgical operations are typically only recommended for people who do not improve with the conservative treatment or if they have worsening muscle weakness. The longer a patient has symptoms of a pinched nerve, and the worse the symptoms become, the less chance there is for a full recovery. Pain, numbness and tingling usually recovery completely with treatment. If a person develops weakness or wasting of the muscles he or she should see a doctor as soon as possible to prevent any permanent nerve damage. A pinched nerve (nerve entrapment) in or near the elbow can cause elbow pain, numbness, tingling, or weakness of the arm, wrist, or hand. The nerve that most commonly gets pinched in or near the elbow is the ulnar nerve. It is located in the elbow area, on the little finger side when the palm is facing up. Less often, the median or the posterior interosseous nerve, a branch of the radial nerve next to the elbow area on the thumb side when the palm is facing up, may get pinched. Patient information: Neck pain (Beyond the Basics). Please share your experience with pinched nerve. What treatments were effective in treating your case of a pinched nerve(s)? What symptoms did you experience with a pinched nerve in the back? How was your case of a pinched nerve diagnosed? What treatments have been effective in treating a pinched nerve? Please share your experience with surgery and pinched nerve. Was it successful? What symptoms did you experience with a pinched nerve?